The most crucial principle to remember is that guests need to be able to see each other so sit down to test your idea and be sure that you’re not blocking people’s views. Centerpieces that create a thick/solid barrier at eye level are a major no-no! You see stunning, dense and elaborate centerpieces all the time on Instagram and in magazines, yet while beautiful, they do not allow for good connection between your family and friends. Keep things thin and open if you want an eye level higher display. If you want a dense, lush look either raise it above eye level or keep it below eye level. Your guests will thank you and your gathering will be a bigger success! The second important principle to remember is the rule of odds with any of the ideas—your eyes like thing displayed in odd numbers! 3 or 5 mini vases with single blooms along the center of your table is better than 4 or 6. The center “big” impact item can be an important dish like your Standing Rib Roast Platter or Beef Wellington and then you can opt for two pretty things on either side be it a small vase or greens display and candle. Asymmetrical displays are fun too: display around a center focal with 1 item on its side and 3 on the other. 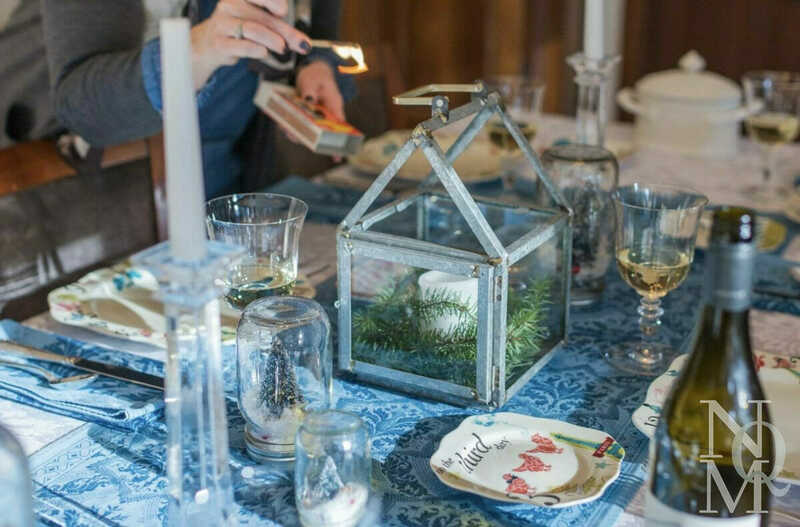 This setting shows both Snow Globes and a Lantern but using just one option is great as well! There are lots of variations of snow globes: from the traditional to the vintage faux style shown. This Lantern is the medium-sized option from Joanna Gaines’ Target collection and I use it often. Greens (or holly) can go inside or outside the lantern. Time and budget saving tip: if you have a lantern that you don’t particularly love, try spray-painting it silver, gold or white depending on your table’s color scheme. You don’t have to battle crowds and can easily grab a $5 can of paint if you don’t already have it. When choosing a candle holder, you can opt for one that holds pillars or tapers, and it best to use one that has a fairly long footprint like this pillar style holder from Crate & Barrel. Then clip some greens (or buy at your local florist/grocery store) and tuck them around the base. For best impact, it’s best to use larger yet simple ornaments unless your table is quite narrow or small, in which case you can scale ornaments accordingly. You can add a big of ribbon or skip it depending on your tastes. I like the look of simple knots with tails or loose, soft bows. Although the adjacent photo is from Thanksgiving, apply the concept to a Christmas centerpiece (or any time of the year for that matter). The key to success with this look is to create a balanced look with flat or nearly flat greens, a layer up of fruit and then taller candlesticks. Choose candlestick color based off of the rest of your table setting as well as the color of fruit that you prefer. My table is on the narrow side so I prefer minimal greens (just 5 stems) and displayed them in a loose zig-zag shape between the candle holders. A soft meandering effect is best here—like a river flowing down your table. For Christmas, I’d opt for 5 or so simple flat pine sections, add my brass Crate & Barrel candlesticks and substitute pretty fruits like red pears, clementines, figs, or pomegranates. I like the fruit even more if I can find pieces with leaves still attached. Variations: For a more rustic look, instead of fruit try pine cones (with or without whole fresh cranberries) plus bump up the greenery and for a more contemporary look, use thin, low greens and try matte finish ornaments in place of fruit. Try just a few flowers (white is lovely if you want a break from red) or if you want to skip flowers, try berries on the branch or add a pine cone balanced on top of a thinner vase. I added two fun Target gold holly branches too for a bit of extra dimension. There are many variations on this: small vases with a sprig or two in them down the length of your table, one large vase as shown is great as long as your table is wide and it doesn’t block guests. Both the gathering basket and wine jug are vintage that I found at flea markets but these days many stores have reproduction options that are similar. Use special service pieces like the antique cake plate below to elevate your menu items into centerpieces. Or make a line of pretty fruit (odd number of pieces of course!) from one end of the table to the other. Fruits like red pears, tangerines or pomegranates add a terrific punch of color and you can elevate them with things like mini cake places or just set them minimalist style on the tablecloth. Add candle holders or not, but because of proportion balance I’d stick with taper candles vs. pillars so your food/fruits are the starts. Greenery is optional but the same principle applies—just keep it as an enhancement to the food, not the main show. Sometimes less is more! Just try a small bouquet or a few stems displayed in a slightly unusual vase rather than a standard glass florist variety. Maybe a teacup or sugar bowl for a brunch, gold votive or small bowl, a vintage silver-plated bowl or teapot, or a silver or mercury glass vase. Use Epsom salts to add a bit of fake snow. Ornaments in a bowl or vase: for elegant, classic look choose identical or very similar ornaments or opt for a color scheme of monochrome or complementary colors, fill vessel and then scatter a few ornaments scattered around each end of the bowl or vase; for contemporary or fun look vary the ornament colors but keep the size/shape identical. Starbursts or dimensional stars sitting on top of pine or evergreens. Group together pillar candles on a platter or wooden cutting board, add a bit of greens, berries or holly sticking out here and there between candles. A platter holding an asymmetrical mixed collection of a few ornaments, greens, votives/small pillar candles and pine cones. Really, the sky’s the limit here…just play off your table’s colors and try not to work too hard! And have a wonderful holiday meal! *This contains some links but they are purely information – listed only to help you. There is no commission or connection to NQM.